■ Lingering warm weather. While most people enjoy Indian summer, unseasonably warm temperatures can make rhinitis symptoms last longer. Mold spores can be released and dispersed during dry, windy weather. Be sure to begin taking medications before your symptoms start. ■ Pesky leaves. For allergy sufferers, raking often presents a problem. It can stir agitating pollen and mold into the air, causing allergy and asthma symptoms. 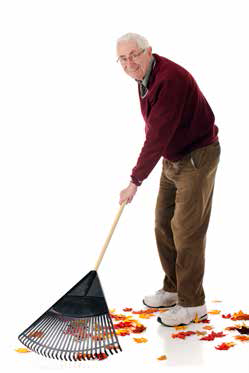 Those with allergies should wear a NIOSH-rated N95 mask when raking leaves, mowing the lawn and gardening. ■ School allergens. Kids are often exposed to classroom irritants and allergy triggers. These can include chalk dust and classroom pets. Kids with exercise-induced bronchoconstriction (EIB) may experience attacks during recess or gym class. Help your child understand what can trigger his allergies and asthma, and how he can avoid symptoms. Notify teachers and the school nurse of any emergency medications, such as quickrelief inhalers and epinephrine.